You folks have been fantastic in your support of this great organization – there are an untold number of people in several parts of the world who will finally be able to enjoy clean drinking water thanks to your specific support. Wine To Water is a 501 (c)(3) non-profit aid organization focused on providing clean water to needy people around the world. Over 1 billion people in the world today lack access to adequate water and sanitation. They are devoted to fighting this epidemic. Wine symbolizes fortune in our society. Their goal is to give the fortunate population an opportunity to fight for those who can’t fight for themselves. Doc & Annie, thank you for all that you’ve done and for allowing us to participate. As we sprinkle sparkle all around the town and around our homes this time of year, how can we help thinking about sparkling wines? My 90-year-old mother attributes her still-lively lifestyle to her regimen of a half bottle of Champagne every day for almost 70 years. She swears that all those bubbles mean added oxygen going to her brain! While we tend to call all wine with bubbles “Champagne,” only sparkling wine from the Champagne region 90 miles northeast of Paris can rightfully be so labeled. That Champagne is made from a blend of one white grape, chardonnay, and two red grapes, pinot noir and pinot meunier. It gets its bubbles from a second fermentation in the bottle — methode traditionelle. In this process, sugar and yeast are added to a fermented wine and it’s closed tightly. As the sugar turns into alcohol, the carbon dioxide, a by-product of fermentation, is trapped in the bottle. Because the cellars where this happens are deep and cold, the fermentation is slow and produces the tiniest bubbles. 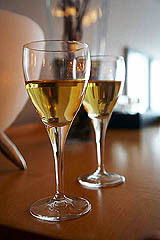 If the wine is labeled blanc de blanc, it is made from chardonnay exclusively, and if it is blanc de noir, it is made only from the red grapes. Although Champagne is no doubt the queen of sparklers, it certainly is not the only choice when it comes to bubbles. France has many sparkling wines that are not Champagnes. Italy, Spain, Portugal, Germany, Austria, the United States, Australia and many other countries also make sparklers. Many of these are modeled on French Champagne but others are original wines made from local grapes with an entirely different taste profile. There is even sparkling sake from Japan! Spanish sparklers are called cava and are made from three white grapes: macebo, parellada and xarello. All cava is made using the traditional method of second fermentation in bottle. Pure and simple, no added complex descriptions – just a very simple reminder to enjoy what life tosses your way, to celebrate the big and small, the successes and lessons learned from times things didn’t work out as planned. Don’t save the “bubbles” for only the special occasions – everyday we live is enough of a special occasion to pop the cork and enjoy something that celebrates you! A solar panel installation at North Carolina’s RayLen Vineyards & Vinery cut the site’s energy bills nearly in half; the winery sells some energy to the utility company. Mocksville, N.C. — RayLen Vineyards & Winery recently threw the switch on what is believed to be the first winery solar installation in the state. Although in recent years dozens of West Coast wineries have taken advantage of state and federal incentives to install solar arrays, to date the practice has been less common in other winegrowing regions. But electricity costs keep rising — substantially in many locales — and wineries use many, many kilowatts of electricity to run everything from grape stemmers and presses to refrigerated tanks. Tapping solar energy not only can hold down utility bills, but as a source of clean, infinitely renewable energy, it also conveys legitimate green bragging rights to those who employ it. Options are expanding, as research and product development improves the choices available. This past summer, RayLen installed 104 100-watt solar panels — enough to power everything from pumps to its office lights. Wine preference can reveal personality traits? What do you think? A taste for Sauvignon Blanc and Chardonnay or a liking for Bordeaux or Zinfandel can indicate more than just a preference in wines. It could also reveal personality traits. New research by scientists in Australia and Britain showed that drinkers who preferred a sweet taste in wine were more likely to be impulsive while those who chose dry varieties had greater openness. “Participants with a sweet taste preference were significantly higher in impulsiveness than their dry preference counterparts,” Anthony J. Saliba, of Charles Sturt University in Wagga Wagga, Australia, and his colleagues said in the report. Obviously, this was a very limited study – less than 100 people isn’t going to tell us about everyone in the world – but on first read, I was thinking about similarities I’ve noticed in friends who like the dry wines versus those who prefer sweeter. I wonder if they’ll test this more – and if they’d ever be able to say that those who like sweeter because they are more impulsive or if they are more impulsive because they like sweeter. Chicken. Egg. So pop your favorite cork – and let us know how your crowd would measure up. WHAT: Nothing gets me in a holiday mood faster than a good, sparkling wine, and this is a very good one, a party in a bottle. Only wine made in the Champagne region of France can be called Champagne, but Biltmore sparklers are made the French way. They hold their own with the best. The grapes are 100 percent Chardonnay, but they are grown in California’s Russian River Valley. Biltmore has other sparkling wines made with North Carolina grapes. The wine is crisp, with high acidity. It has a spicy aroma with strawberry and lemon tastes. The finish is clean and tart. The pretty pale-yellow color shows off the tiny bubbles. It’s made in the traditional Champagne way, with a secondary fermentation in the bottle. The wine spends 18 to 24 months in the bottle before disgorging and final corking. This is a brut, which means it is slightly drier than sparkling wines. Serve it chilled, about 40-45 degrees. World AIDS Day is the one day when individuals and organizations across the world join together to bring awareness to the global AIDS epidemic. 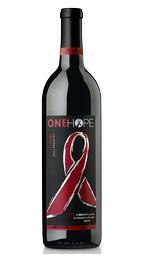 Join us in the fight against AIDS by raising a glass of ONEHOPE Merlot. 50% of the profits are donated to @AIDSLifeCycle to help make an impact on the cause. One Hope Wines was formed by a group of young adults helping a friend who’d been diagnosed with Hodgkin’s at age 23 – The new name symbolizes the idea of a group, no matter how small or big, coming together as ONE and working towards HOPE for the future. Wine is a living, breathing commodity that has always helped bring people together in common purpose. We can’t think of a better vehicle for change. We’re proud to be offering their wines to the public. In fact, we love the idea of ordinary people doing extraordinary things for others through wine, that we are creating a special category to showcase them – Drinking Well While Doing Good. We’d like to carry other labels that do similar things as well- anyone have any suggestions? Meanwhile, order a case and throw an awareness party or simply a bottle for yourself to enjoy – all the while knowing that you’re Drinking Well While Doing Good.